Treasurer Joe Hockey is experiencing difficult times. Deteriorating terms of trade and an uncooperative senate mean that he cannot deliver the surplus when he said he would and he cannot continue to cut government expenditure without risking a recession. I have some comforting news for Joe Hockey: the importance of the whole deficit/surplus thing has been greatly exaggerated – with a lot of help from Joe himself of course. The focus on deficits and surpluses distracts us from what’s really important in the macro economy. 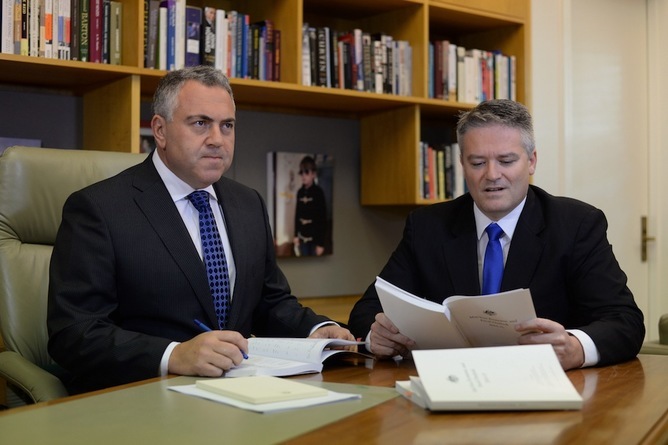 Hockey and Abbott are very fond of using household analogies when discussing government finances – Hockey again compared Australia’s economy to a household budget in his Mid-Year Economic and Fiscal Outlook. However, a government that is sovereign with respect to its own fiat currency bears no resemblance at all to a household. Such a government creates the money we all use, either physically on a printing press or, more importantly, electronically in the accounts of financial institutions. Everyone understands that governments can create money. Most people also understand that governments don’t just create all the money they need for all the things people want because it would cause inflation. Inflation is the devaluation of money. If you have a really good season for growing apples and there is a glut, the price of apples falls. Similarly, if you have a glut of money, the price of money falls. That’s inflation. So, here lies the key insight. Inflation is the limiting factor for government expenditure, not taxes or borrowing. A government that can create money doesn’t need your money from taxation or from borrowing in order to spend. There is no limit to how much money a sovereign government can spend, but if government spending plus private spending exceeds the productive capacity of the economy then you get inflation. The real calculation faced by government should not be about how much money the government has – it has an infinite amount. The calculation should be about the capacity of the economy to absorb government spending without driving inflation. Seeking a balanced budget and automatically borrowing any deficit spending (as we currently do) is an effective but unsophisticated way of ensuring government spending doesn’t cause runaway inflation. Taxes and government borrowing remove money from the private sector, creating space for government spending (which injects money into the private sector). Remember, the government does not have to borrow or tax in order to finance spending because they can create money. The slowing Australian economy combined with the dramatic fall in global oil prices mean that inflation is set to fall and unemployment is rising. This is precisely the kind of environment into which the federal government could spend without borrowing (i.e. create money). Times like these represent opportunities for the government to finance productivity improving infrastructure and provide much needed services for nothing. I know it sounds too good to be true but this is the reality of a fiscally sovereign government. Can the government just spend as much as it wants on whatever it wants? Of course not, the result would be out-of-control inflation. Can it spend a lot more than it currently is without substantial negative consequences? Absolutely. The much discussed “quantitative easing” in the US, UK and EU is an example of this kind of spending (though very poorly targeted). The US Federal Reserve has created trillions of dollars out of thin air and used it to buy risky financial assets and government bonds in order to take the risk off the balance sheets of financial institutions and improve their supply of money. The money was created with keystrokes on a computer which simply credit the accounts that these financial institutions hold with the Federal Reserve. There has been no runaway inflationary impact of this “printing” of trillions of dollars. This reality of fiat currency is very difficult for many people to grasp but it’s not quite the magic pudding that perhaps it appears to be. When a government creates money, it isn’t creating value from nothing. The value lies in the human and capital resources that are underutilised in the economy. The money created by the government is simply the lubricant needed to mobilise these resources. So, productive government spending is limited by the capacity of the economy to provide the goods and services that the government wants to purchase plus the goods and services the non-government sector wants to purchase. During economic downturns, and especially in recessions, there is spare capacity in the economy which can be employed by government. It’s possible, with this in mind, to quite easily return to the post-war days of genuine full employment even during an economic downturn. Until people understand the basic realities of monetary economics we cannot have a meaningful discussion of government finances. Rather than worrying about deficits and surpluses we should be asking whether the economy would benefit from greater or lesser government expenditure or taxation. This calculation balances unemployment, spare capacity, and the need for infrastructure and services against inflation risk. It’s a complex calculation but the underlying principles are pretty straightforward. Let me just restate for emphasis: the need for balanced federal budgets is a myth. Like many myths, it does have some factual historical origins. Back when currencies were backed by gold it was possible for governments to go broke. Because modern currencies are not backed by anything material, sovereign governments cannot run out of money and can never be insolvent in their own currency. Somehow, mainstream political thinking hasn’t kept up with the dramatic changes in the monetary system that occurred more than 40 years ago. The first of our politicians to really understand this and to communicate it effectively to the public will have at their disposal the tools to completely reshape our economy for the better. I know politicians can be slow off the mark but 40 years is long enough. It’s time they caught up. This entry was posted in Australian politics, Economic theory, Modern Monetary Theory and tagged deficit, democracy, Economic policy, government budget, MMT, The Conversation. Bookmark the permalink. Proclaiming the national budget is just like a household budget is the primary method by which the rich (who essentially own and control lackey politicians like Hockey) are able to increase the COMPARATIVE income, wealth, power and opportunity gaps. Guys like Hockey and most of his fellow politicians are not idiots-they know a sovereign currency issuer can “print.” Fear of “debt” or inflation may be of concern-but the much bigger fear is the fear of losing the support of rich donors (whose primary goal is increasing the GAPs) and that loss of $ is a death knell to any politician. I think there are two constraints on money finance – which is what you’re suggesting – the first is inflation as you suggest and, at least judging from your review of his article attacking you and others, it seems Peter Swan misread you wilfully or otherwise. But there’s a further question. If you money finance government spending you may need to withdraw those funds from the system as recovery takes hold – imposing a fiscal drag on the system. This is all accounted for in traditional debt-funded fiscal expansion. If money finance is really like bond financing – which in this scenario it is – then the household analogy is not so wide of the mark. Spending now entails interest and repayment of that spending. Is this really true? ( I confess to being a layperson) My understanding was that most “money” is created by private parties in the form of one kind of IOU or another. Loans at banks or, more importantly in modern life, the repo market, for example. The wholesale creation ( and contraction) of such money like stuff being an important part of the WFC. Thanks for your comment. You’re right. I should have been clearer about the different types of money creation. Banks do indeed create much of the money we use. Banks create money (deposits) and anti-money (loans) at the same time that kind of annihilate one another from an accounting perspective like particle and anti-particle. Only governments can create the money without the anti-money.